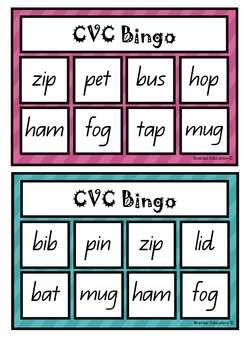 Includes: 12 bingo cards displaying CVC words, 12 bingo cards displaying CVC pictures, calling cards and instructions for use. (24 game boards in total). 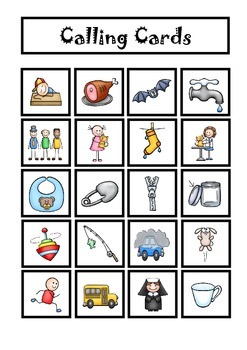 Option 1: Each player is given a picture game board. 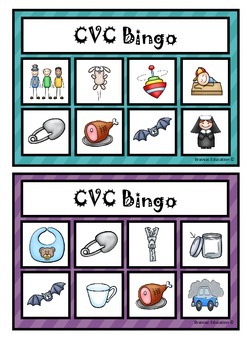 The caller holds up a cvc word card and players attempt to identify the word. If the word is on their game board they may place a counter over it. The first player to cover all pictures yells out bingo and is the game winner. Option 2: Each player is given a word game board. The caller holds up a picture card and players identify the picture. 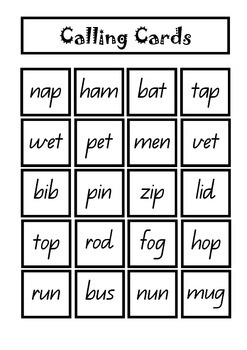 Players must then look if they have the corresponding word written on their game board. If a player does have the word on their game board they may place a counter over it. The first player to cover all words yells out bingo and is the game winner.